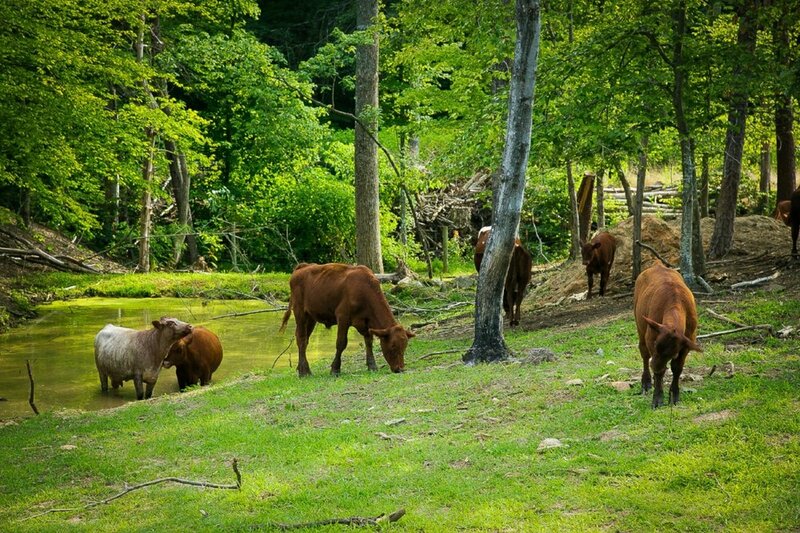 Yokeley Farms is a small, sustainably managed cattle farm located in the Town of Wallburg. We manage a herd consisting of Red Angus and Shorthorns. We added the influence of Shorthorn into our breeding program in order to produce a beef with a greater degree of marbling. Locals know the quality of our beef, which is featured in Wallburg Diner's Backyard Burger. Nationally, we ranked 16th in the country at the American Royal Steak Contest in 2017. All our beef comes from the steers that we have personally raised. This way, we are able to say without a doubt that our animals are raised with No Implants, No Antibiotics or Added Hormones. At Yokeley Farms, we grow all the hay that is used in the supplemental feeding of our cows. We maintain Orchard Grass, Fescue and Forage Bermuda fields. Our pastures are sown with the addition of Oats, Ladino Clover, Turnip, Daikon Radish, Australian Winter Pea, and a Forage Rye. This forage blend supports the nutritional needs of our cows during the winter months. We use a rotational grazing practice on the farm to help ensure year-round grazing. We offer beef that has been pasture-raised and supplemented with spent grains from Kernersville Brewing Company. Join us for a tour of our farm starting at the Main barn. Meet our show heifer, our momma cows, and of course, Maddie, our donkey! We will complete the tour with a stop at our Beef Market and learn about the various meat cuts that you may not have known about like bavette, and gather some grilling and slow-cooking tips from Chef Randy. Take this opportunity to meet some of our community farms such as Shady Cedar Farm, Majestic Family Farm, and Snyder Family Farm. Additional special guests include Kernersville Brewing Company and our live music performers KBC Brewhouse Band. BRING A COOLER to stock up on delicious beef, pork, and eggs. Additional Directions: Harvey Teague Rd. turns off Wallburg Rd. at Olde Homplace Golf Course. Look for directional signage that will lead you to Yokeley Farms.